This is a quick update to add iPhone X compatibility. Much bigger update is currently in the works. 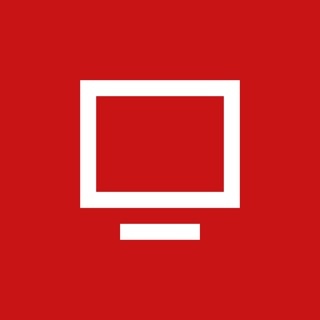 This is BY FAR the best tv tracking app i have ever used! None of the others even come close. I watch a lot of TV, so i use this to track upcoming shows, and also to track shows i plan on watching. 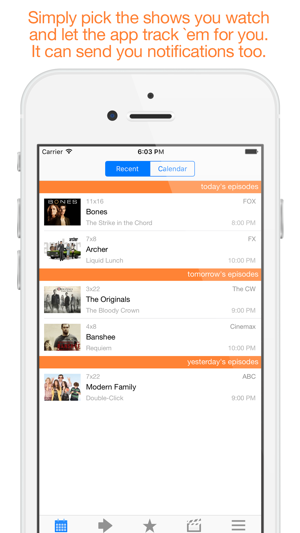 It’s super convenient to have all the shows you want to watch in one list, rather than on separate apps, etc. 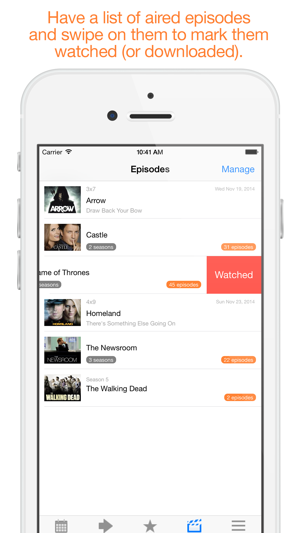 I also use it to track watched episodes while i am watching a show. I have been using this app for probably over a year, and haven’t had any problems really! Also, i have requested maybe 10 or so shows to be added, and they were added within a few hours of my request! $4.99 is a very small price to pay for this app! Trust me, no other app will even come close, and will probably be more expensive with less features. I also think it’s really cool that it tells you how many total hours it has taken you to watch everything marked as watched, and for everything you’ve yet to watch. 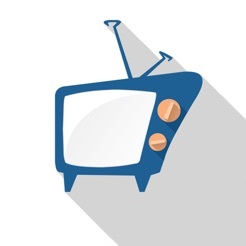 This is a good reliable app to track all of your favorite TV shows you may follow. It doesn't have all of the bells and whistles some of the other tracking apps may have, and it may not even have my favorite look and feel next to a few others, but the one thing I can say about this app is it works. It delivers your notifications when it should and so far it's never crashed on me. I can't say I've had the same experience with some of the other TV tracking apps. In fact without mentioning names, one app I tried and loved the look and feel of and wanted to pay for the premium version of said app, but 3 times I entered all my favorite TV shows to follow and 3 times it crashed and I lost my whole list. Also notifications weren't alerting me about show times. What good is a great looking app if it doesn't perform well. Where this app may lack in looks, which let's face it only comes down to preference and my opinion anyhow, or features, it makes up for in it's stability and function. 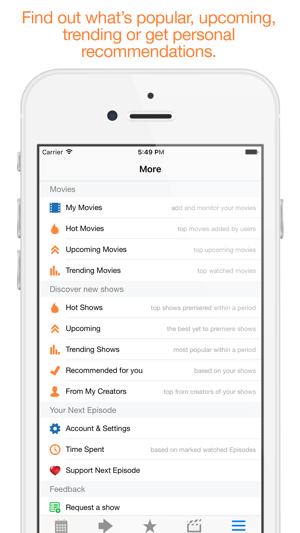 This is a great app to track your shows and movies in one handy app. 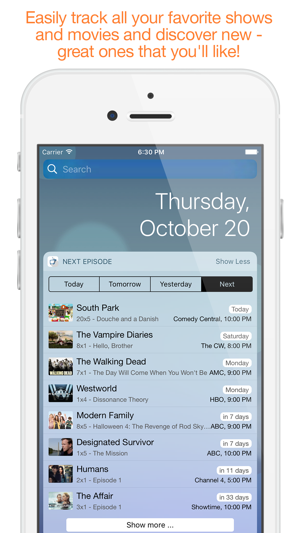 If you purchase the app, you get notifications and can add all the shows you want. 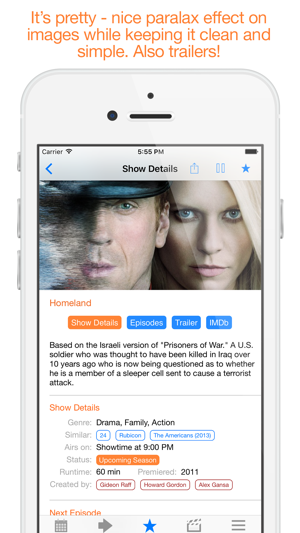 The pause feature lets you take shows that you haven't caught up on off the watch list so your watch list isn't too cluttered. But it's still part of your shows and you can unpause and restart tracking at any time. Recommendations could use a little work. Also you have to access movies through the More button. I'd appreciate it if they gave movies it's own button. Another thing I really wish they had is checklists. Another app has this feature and I really liked it. Mostly because it's impossible to uncheck an episode you accidentally marked as watched on this app. You have to delete then re-add the show. This is one of my most used apps and I liked it so much, I purchased the full version. You should too,you won't regret it!